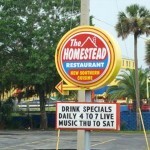 Once a Jacksonville institution, the Homestead Restaurant is today no more – replaced by a “Taco Lu”. But there were plenty of ghostly claims at the location, including a mysterious “Lady in White” who walked the premises. No word on whether the taco place continues to experience these strange phenomena. The taco restaurant is actually called Taco Lu, not lulu. Also, a friend of mine works there and says yes it is still haunted. She reports bathroom stalls locking and unlocking, bathroom lights shutting off, tableclothes being ripped off of tables, footsteps upstairs when no ine is up there, whispering, and being shoved off the staircase. Also, seeing a woman in a nightgown walking up the stairs. Also, the food is AMAZING! Only haunting experience I had at taco lu was the horrible food.